Thanks for visiting my vintage Hamilton watch blog. I like to restore US-made Hamilton wrist watches back to their original glory and share my experiences with other enthusiasts. Use the "Search" space below if you know what model you're looking for. Feel free to leave polite comments or questions in the spaces provided. Also check out my "watches for sale" on my Etsy site - the link is on the right, just below. Have you ever had a strong feeling of deja vu or seen someone and said, "I know that person, but how do I know them?" Sometimes it's easy to have that feeling when it comes to Hamilton watches as occasionally the same dial (or a very similar one) is used on different models. 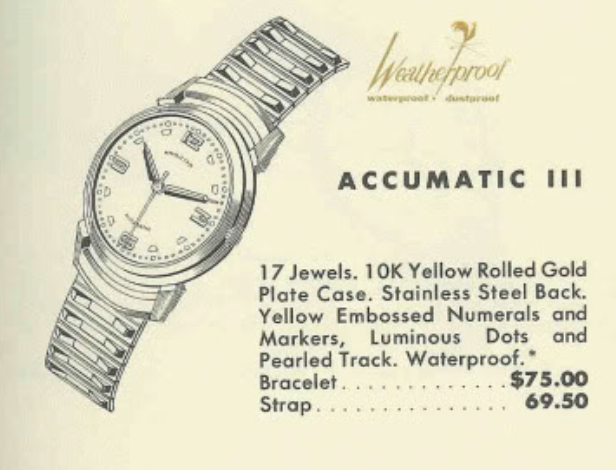 A great example is the 1958 Accumatic III. It shares a very similar dial with the 1957 Seabrook. The only difference is the Accumatic III says AUTOMATIC above the 6. Since the Seabrook is manual winding, it's dial is unmarked. The Accumatic III was produced for only two years. Initially it was offered with the bracelet shown below. Then in 1959 it received a different style bracelet. So if you happen upon an Accumatic III with a bracelet like either of these shown, you'll be able to date the watch more accurately. The Accumatic line was meant to be slightly less expensive than the Automatic K-series models from the same era. 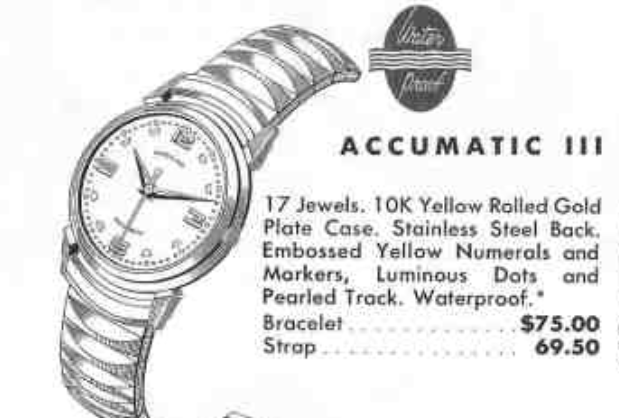 Although eventually by the 1960's Accumatics came in all sorts of flavors and price points. But the Accumatic III is true to its roots and came in a 10K RGP case with a stainless steel back. Tucked inside is a Hamilton 672 which is an ETA 1256 automatic movement. This grade was used in the earlier Hamilton Illinois-branded autos initially offered in 1953. The Seabrook features the Hamilton 671, the same basic manual winding movement but without the oscillating weight, etc. I recently scored an Accumatic III and I got a decent deal since it was listed as not running. You always take a chance on watches like that but I'd rather buy a known non-running watch than a watch that runs in some positions but not others - as you know that watch has a balance issue. I probably also got a good deal because the crystal is cracked. The stainless steel back is engraved with three initials. It will unscrew off. I was able to identify the non-running issue. One of the rotor carrier screws was missing and I found it under the balance wheel. All the parts are separated and cleaned before being reassembled with fresh lubricants. A new acrylic crystal will be a dramatic improvement to the watch. 28.1mm diameter should do the trick. The basic movement is reassembled and the mainspring is wound up a little. It should start running when I put the balance back on - if everything is okay. The movement is running briskly - that's a good sign but only the timer will tell for sure. Well, there's nothing to complain about this watch's timekeeping. Pretty much right on the money with good amplitude and a low beat error. All that's left now is to put the movement back in the case, with the dial and hands of course. A new teju-lizard grain strap in brown completes the restoration. This is a really sharp looking watch. There is a very slight radium burn on the dial from the hands being stuck at about 8:18 but it blends in nicely to the pearlescent glow of the textured dial. Great looking watch! Is there a particular name for this numeral style (font?). I know I've seen it on other Hamilton watches. There are some pretty common styles I am familiar with. There's the AGN numerals from the 30s, 40s and 50s. There's also the black enamel style from the 30s, and maybe the early 40s. Just curious about these numerals. They're quite distinct...and even more attractive the more I look at them. Great restoration Dan...I just love the look of this watch! I have a watch that the crystal is so terribly cracked, that there are about ten pieces of it. With that said, I cannot measure the existing crystal to get a new one. I also have several watches that are missing crystals altogether. How could I get the corrext crystal for these watches? Measure the inside of the bezel? Sometimes crystals can be ordered by the model name. If they are vintage watches and you know the model, you can probably do a little research on your own. Otherwise you have to measure the bezel opening as well as assess the shape of the crystal. Some crystals are flat on all four sides and sometimes the sides are curved, or domed, even if the crystal is square. Specifying crystals is very tricky and there's a lot to it that can't be explained easily. Be a "HandyDan Fan" and join the growing list of elite members! All photos and content copyrighted 2012 - 2019 HandyDan. Simple theme. Theme images by luoman. Powered by Blogger.